With over 70 Miles of beatiuful beaches it can be a task in its self just choosing one, here we give you the run down of everything you need to know to help you plan your perfect day out at the beach. 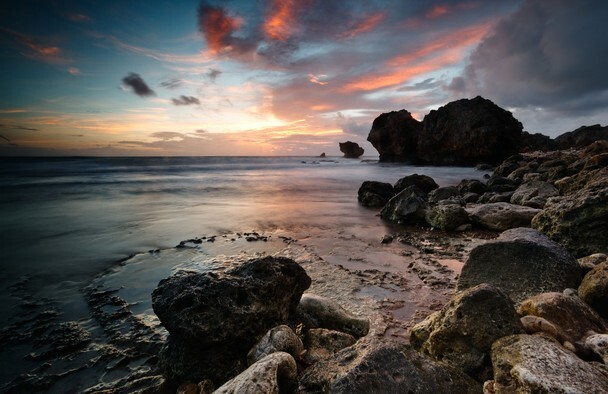 Cattlewash Beach is found on the East coast of the Barbados in the parish of St Joseph, with long stretches of untouched beaches its perfect for those idillic long walks. Battered by the strong winds of the Atlantic ocean , swimming is not recommended although there are several mineral rich pools to be taken advantage of, should you feel the need to cool down. Bathsheba Beach otherwise known as the soup bowl sits on the jagged east coast of Barbados. Known for its annual international surf competitions, visitors also come to take in the delightful scenery. With a beautiful picturesque coastline of scattered rock formations, battered by the Atlantic ocean, it’s not the typically calm, turquoise waters usually associated with the Caribbean. A small fishing town with a few local rum shops & restaurants to discover Bathsheba holds a lot of character and is definitely worth a visit. 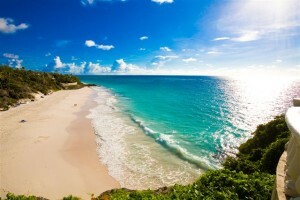 Located on the east coast of Barbados in St Philip is Crane Beach. Originally a harbour, is considered by many to be one of the island’s most beautiful beaches. In fact, Lifestyles of the Rich and Famous rated it as ”one of the ten best beaches in the world”! 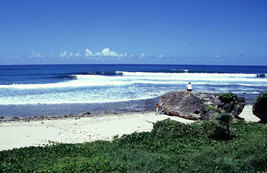 The sea is quite choppy with powerful waves, making the Crane beach a great spot for boogie boarding. The long stretch of white sand beach has a backdrop of trees which provide shade in the afternoon. Beach chairs and umbrellas are available from vendors who also sell soft drinks and beers. The Crane Resort & Residences, standing on the cliff above the beach, has been a favourite with honeymooners since it opened in 1867. 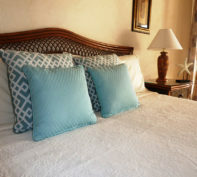 Over the years it has expanded and now boasts several pools and spas with luxurious olde-worlde accommodation. A great place to get away from it all! If you want a little taster of what the Crane Resort has to offer, you can book their Sunday brunch where local gospel singers will serenade you whilst you dine. Reservations required. 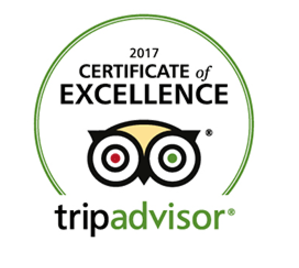 For other local eateries we heartily recommend Cutters Deli with a diverse menu you won’t find just anywhere in Barbados. 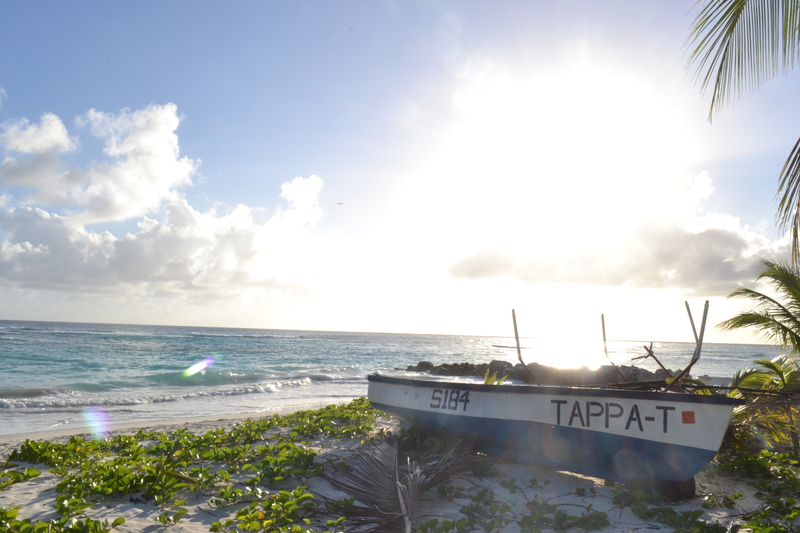 Your vacation in Barbados won’t be complete without a trip to Crane beach, trust me! 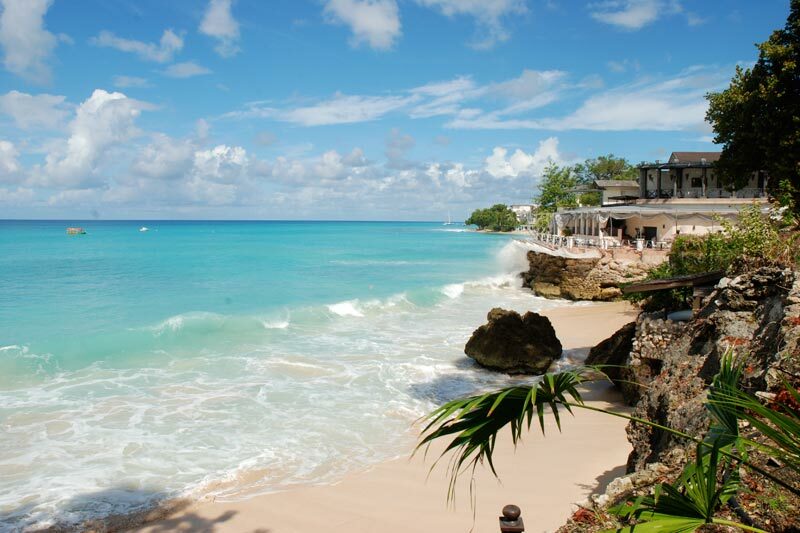 On the south coast of Barbados, in Enterprise, is Miami Beach, also known as Enterprise Beach. This beautiful stretch of beach is rarely crowded during the week, but can get busy at the week-ends and on public holidays as it is a popular picnicking spot for the locals. The western side of Miami Beach offers calm waters and is the ideal place for children to wade and swim. On the eastern side you should be aware of the swells and you should avoid bathing near the cliffs, especially at high tide. For your safety there is a lifeguard on duty. Miami Beach has a quaint charm, not at all commercialized, although you can rent beach chairs, umbrellas and boogie boards from local vendors and enjoy snacks and drinks from vendors. The Mr. Delicious food truck, (it’s actually an old bus!) located in the shade of the trees, offers some of the best fishcakes on the island! There are several picnic benches where you can enjoy your meal and cool off in the shade of the pine trees. You will also see local keep fit enthusiasts exercising on the benches and working out on the beach! 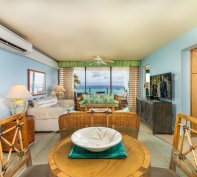 The nearby Little Arches hotel is a charming boutique hotel with a lovely restaurant, Café Luna, overlooking the ocean for lunch or dinner, reservations required. 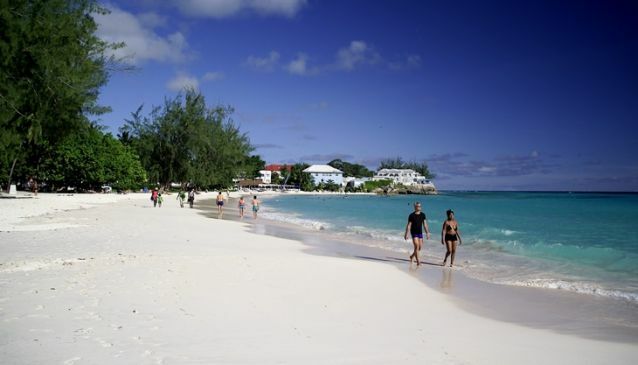 Otherwise known as Sandy beach, Worthing beach sits on the the south coast of Barbados. With a coral reef running from St Lawrence gap 300m north, this beautiful stretch of white sandy beach offers great swimming for children and beginner swimmers. With several boats moored in these calm waters, you will often see fisherman return from their day out at sea and more often than not they will have a catch or two to show for their efforts. 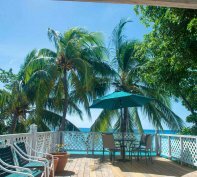 There are two bars that sit on Worthing Beach, Carib & Crystal waters. Both offer a selection of reasonably priced drinks and bar snacks, Carib being more suitable for those looking for a sit down meal. Every Sunday Crystal Waters hosts their weekly live entertainment & BBQ. The BBQ 101 is hosted by a local family with a talented chef offering the best in local cuisine. Great value for money & superbly executed. Sundays down at Crystal Waters are definitely not to be missed. Otherwise know as Rockley Beach, roughly a 15 minute walk north of St Lawrence Gap, Accra Beach is situated in the parish of Christ Church. 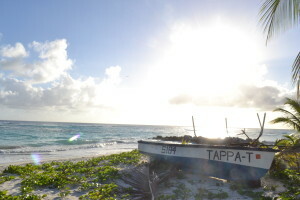 An energetic beach normally bustling with tourist and locals looking for a day of sun filled fun. The waves at Accra vary by day but usually offer good fun for children looking to body board or beginner surfers. Set on a beautiful stretch of pink/white sand is Brownes beach at Carlisle Bay. With its calm sea and beautiful blue waters, It’s a favourite of both locals and tourists alike. It’s conveniently located close to the port so day trippers from the cruise ships can often be seen sunning on the beach or treating themselves to lobster at the wonderful Lobster Alive Bistro & Bar. Or you may want to try The Boatyard. 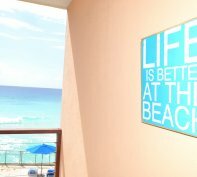 Open daily with plenty of beach packages which ensure a fun filled day of pleasure in paradise. 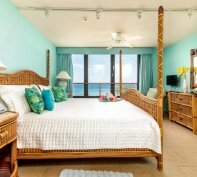 So much at your disposal – from beach chairs to ocean trampolines with live music. 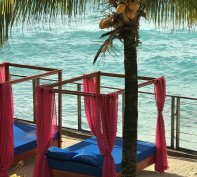 Or if you just want to try some local food with a cold beer, check out the Coco cabana beach bar, offering Bajan cooking and grilled chicken and fish. 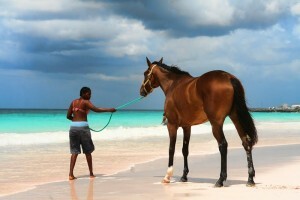 In the evenings keep fit enthusiasts can be seen walking or jogging the length of the beach: local children playing bat and ball after school and even trainers from nearby Garrison Savannah racecourse exercising their horses. Whatever you do, don’t leave without capturing one of the beautiful sunsets. You will treasure the memories! With golden sand and clear turquoise waters Mullins beach is one of the more popular beaches on the west coast of Barbados. The calm and shallow waters make this a enjoyable beach for the whole family, offering good opportunity for swimming and snorkelling. Beyond the roped off swimming area offers a little more adventure with an array of water sports available. Sitting right on the beach is the excellent Mullins restaurant & beach bar, offering superb food, divine cocktails, great atmosphere & friendly staff. The perfect place to sit and watch the sunset after a hard day on the beach. For those travelling by car, Mullins has a newly built car park located just across the road. It is also recommended you get there early as it can attract big crowds in peak season.